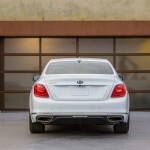 The first Kia K900 flagship large luxury sedan debuted in 2012 to a lukewarm reception, with consumers shying away from a $50,000-plus Kia. 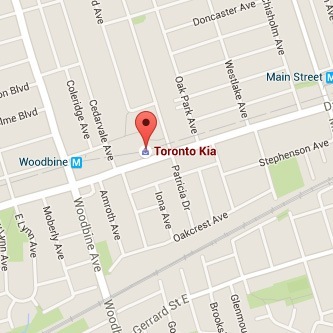 But Kia is good at self-examination and learns from feedback and critiques. 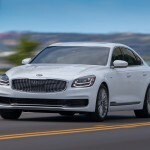 So, they’re back at it, with a fully redesigned version of their flagship, the 2019 Kia K900, following on the heels of the highly-acclaimed 2018 Kia Stinger. 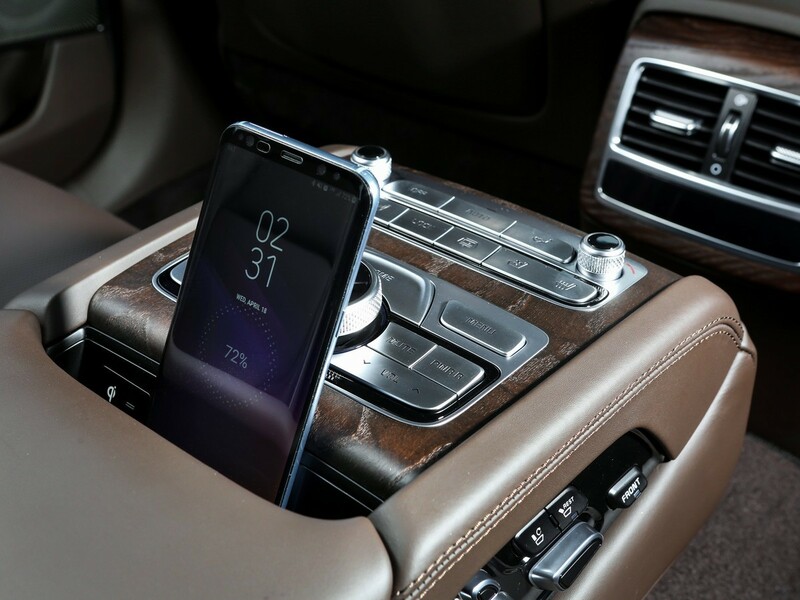 I had the opportunity to put the redesigned K900 to the test, driving through the city streets and countryside of Seoul, South Korea. 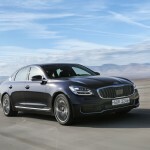 The K900 (known locally as the K9) makes a large statement, coming in at 201.6 inches long, about 3 inches shorter than the Cadillac CT6 and 7 inches longer than the BMW 5-Series. 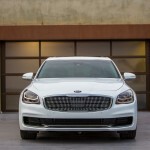 Kia calls the new exterior design language “The Gravity of Prestige.” A collaborative effort by Kia’s global design headquarters in Namyang, Korea and Irvine, California, the new K900 sedan features organic lines with precise details. 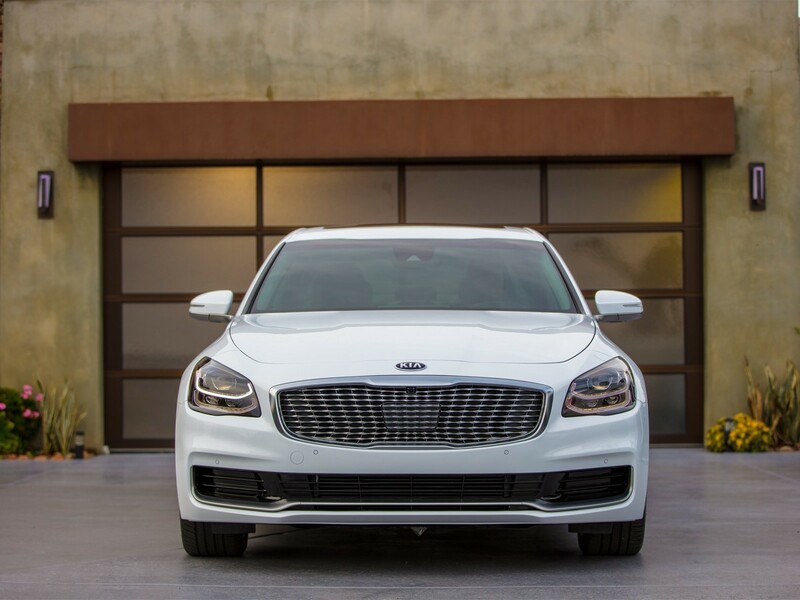 My snow-white pearl test car sparkled in the Korean sunlight, cascading over the lines of the K900 even as the day time running lights of the bi-level headlamps winked in the brightness. 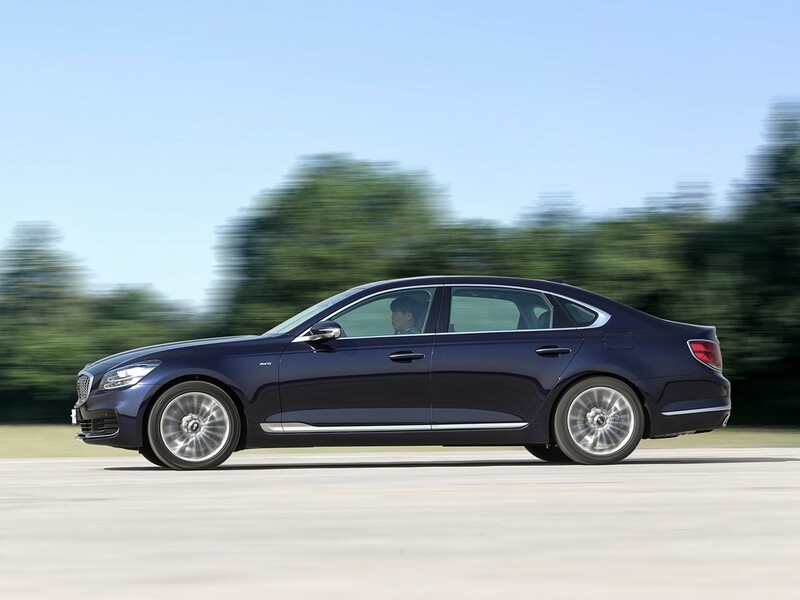 The proportions of the vehicle cut a dashing profile, reflecting the rear-wheel-drive foundation of the all-new platform, with tires pushed to the edges and the overhangs kept to a minimum. The front is a bit busy for my taste and I fear it won’t age well, but the rear is elegant, with modern tail lamps topped off with dual chrome exhausts. 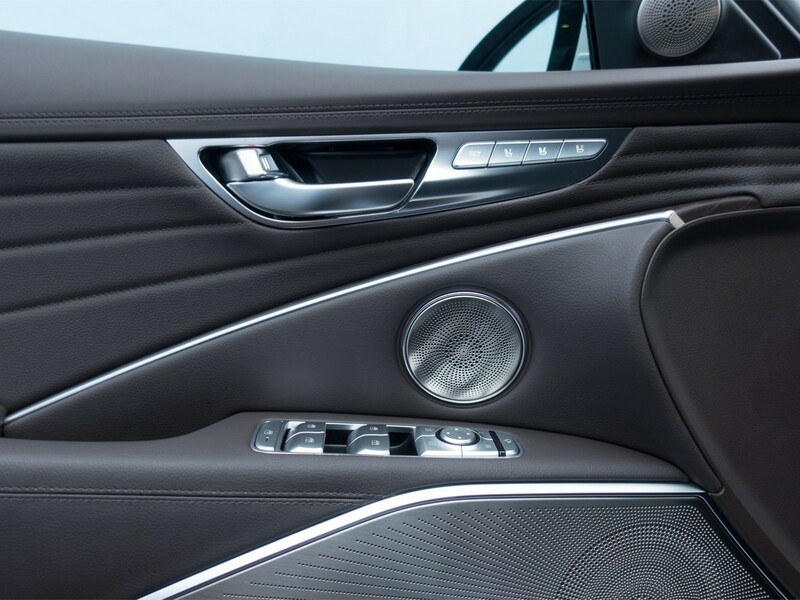 Opening the door to the K900, your attention is captured by the high-end interior materials: Nappa premium leather, matte open-pore wood for added durability, touches of bright and matte chrome. 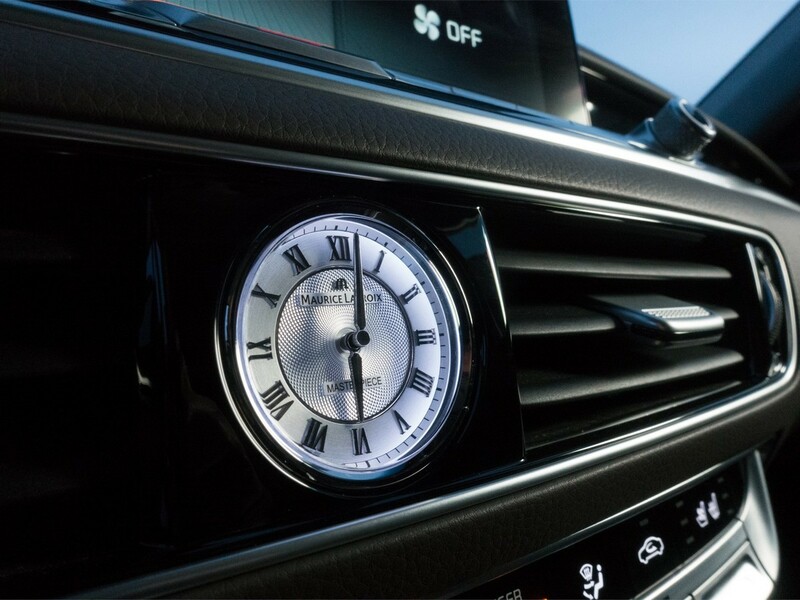 The instrument panel is clean and inviting, anchored by an analog clock in the center designed by Swiss luxury watchmaker Maurice Lacroix exclusively for the new K900. 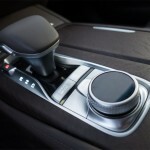 Settling into the contoured seat and using the 20-way power-adjustment to personalize my driving position, I also enjoyed the optional seat ventilation. 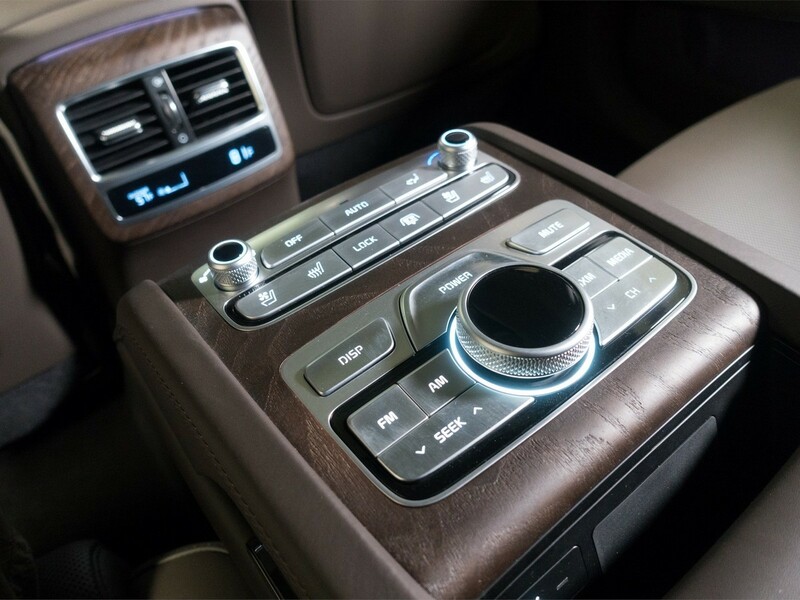 The ergonomics of the cabin are intuitive and modern, with a layout that highlights the driver and welcomes the passenger. 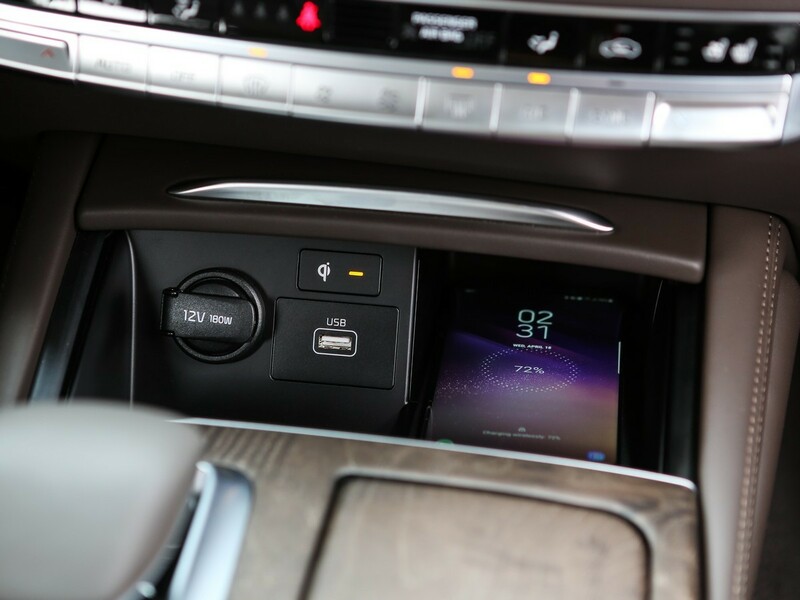 My phone is easy to connect and tucks neatly away in the center console. 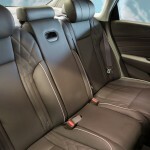 The comfort isn’t confined to the front seats, though. 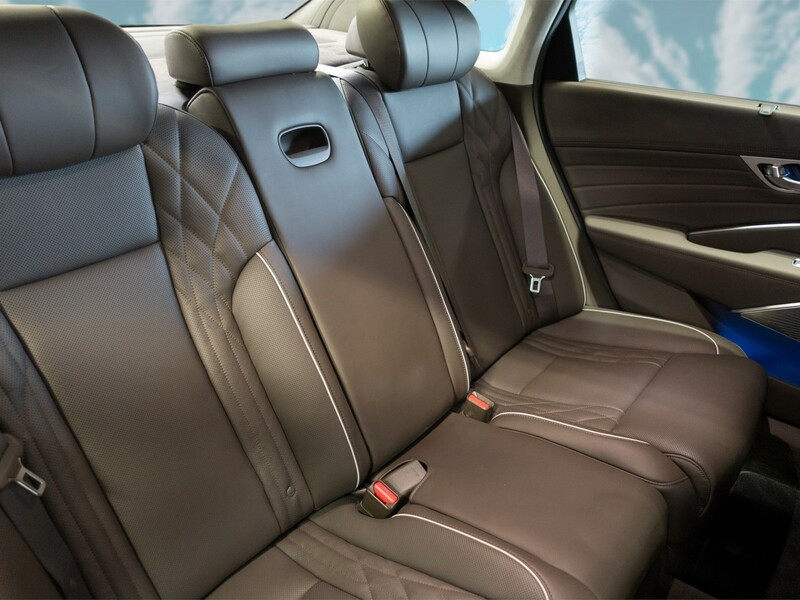 The fully adjustable rear seats, in true Korean style, provides enough legroom for the tallest percentile without compromising the front seat occupants. The trunk is equally spacious, fitting an oversized hard-sided suitcase plus two bloated carry-ons comfortably, with a pass-through for long, skinny items like skis. 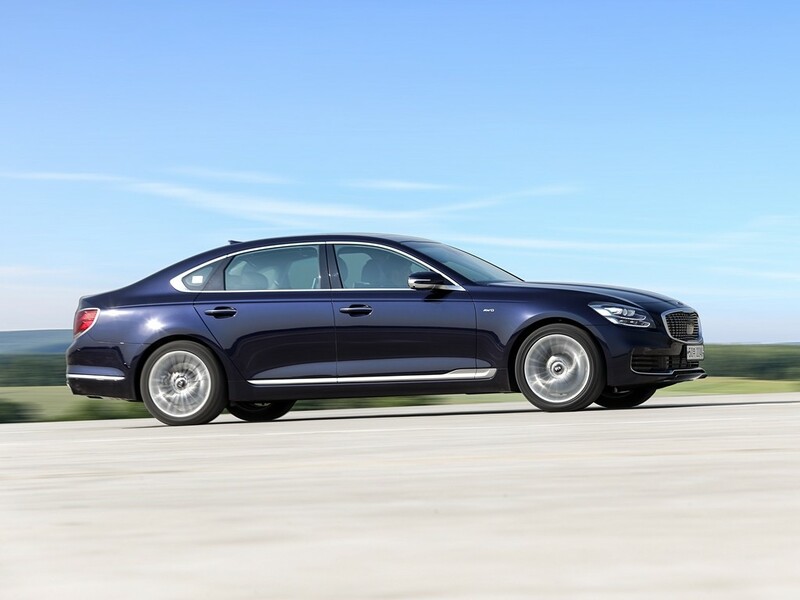 As suitable for today’s luxury sedan market, the 2019 K900 comes equipped with all-wheel-drive (AWD) with dynamic torque vectoring control for improved handling, stability and agility in every type of weather condition. 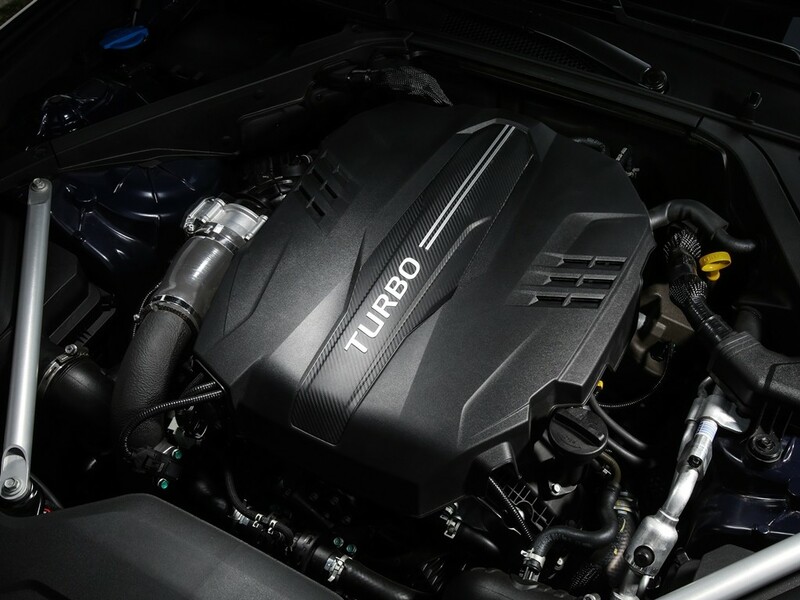 Kia pairs the AWD with a twin-turbo 3.3-liter V6 also available on the award-winning Kia Stinger sports sedan. 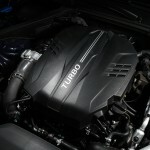 This engine received a ton of well-deserved positive reviews and is another fine example of Kia’s ongoing evolution. 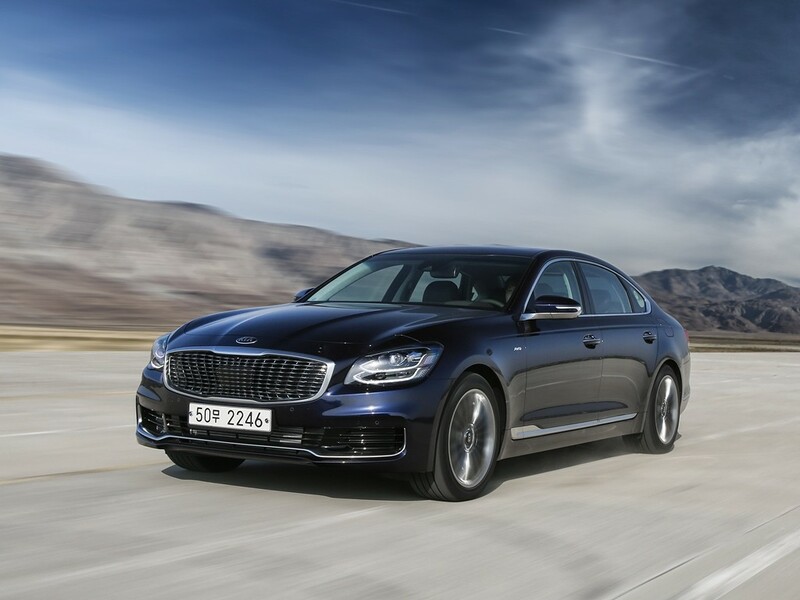 The 365 horses–30 more than the BMW 5-Series and Cadillac CT6–provide exhilarating turbo power with no hesitation and the 8-speed gearbox transitions through its paces seamlessly as I accelerate onto a 4-lane highway. 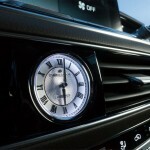 The V8 offered on the previous generation K900 has been dropped in the U.S. market. 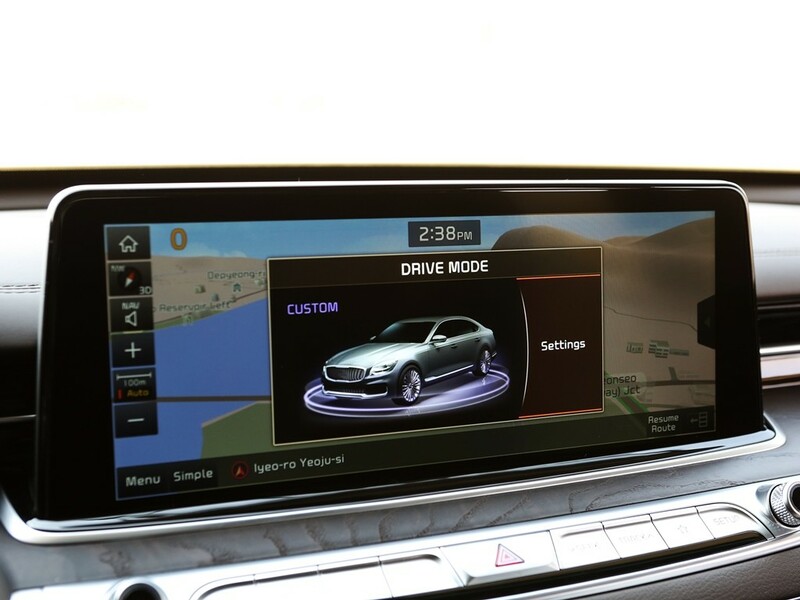 Pulling out onto the busy streets of Seoul, the K900’s navigation kicks in, providing precise directions including specific lanes I need to be in to complete the next task. 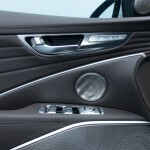 The K900 is also equipped with multiple driver assistance systems (ADAS), including the Surround View Monitor, which utilizes four cameras to provide a 360-degree top-down view of the car and its surroundings, while turn-signal activated blind-spot monitoring keeps an eye on adjacent lanes and shows up in the instrument panel. 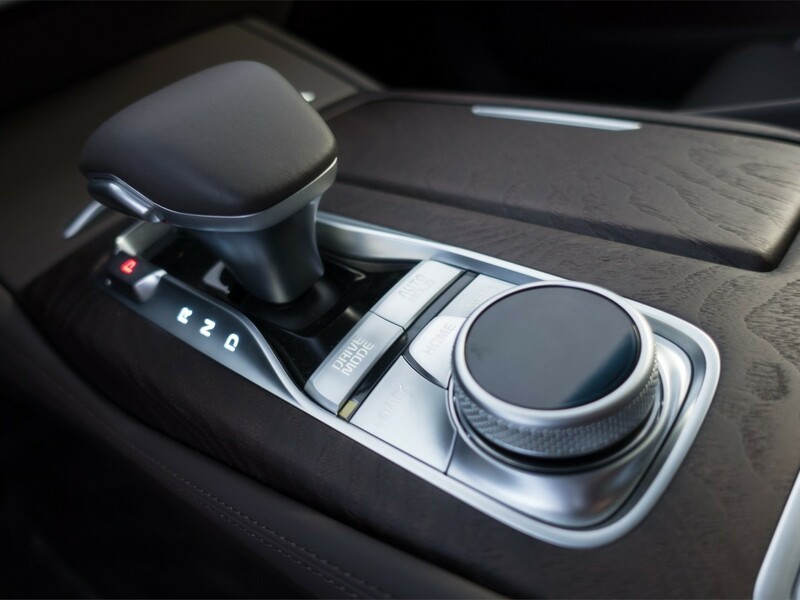 Haptic feedback where the steering wheel vibrates is also available, further enhancing the driver’s visual cues to unsafe lane changes. 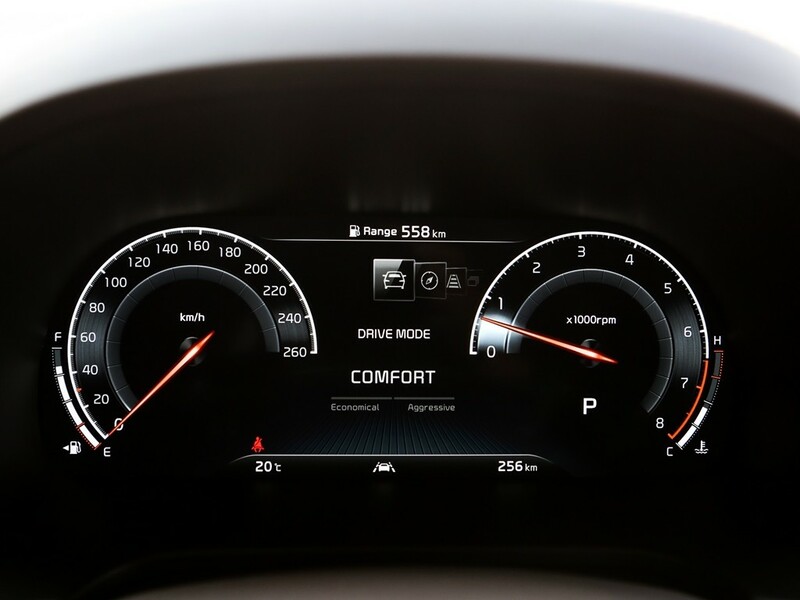 The high-resolution video of the blind-spot monitoring is a bit distracting in the instrument cluster, but that’s a personal preference, and I found myself adapting quickly enough. 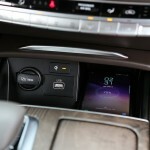 Once at full highway speed, the extra attention to insulation Kia paid in this redesigned K900 is well represented, providing a level of quiet seen in far more expensive vehicles. There is no hint of road noise nor vibration. I’m taken with the peace, calm, and coziness of the cabin. 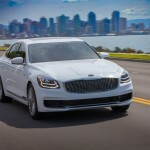 The suburban streets wind through neighborhoods and the K900 sedan hugs the road, the AWD and suspension handling the curves and many, many speed bumps with aplomb, barely missing a beat even as I fail to slow for some. 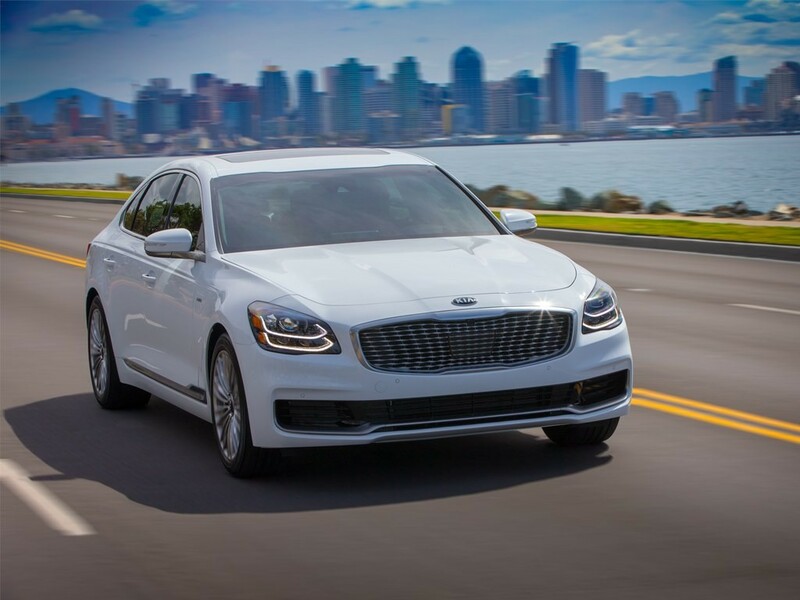 The bumps act as a surrogate for the poor conditions of many roads in the U.S. and once stateside, Kia’s new sedan will be a formidable match for the potholed domestic landscape. 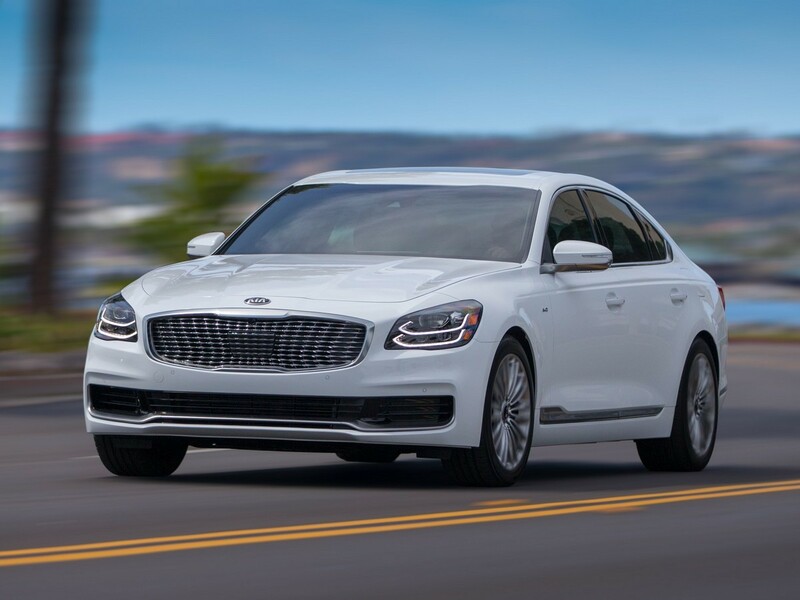 The 2019 Kia K900 offers ‘Normal’ and ‘Sport’ AWD driving modes, with the former providing an efficient driving experience while the latter is more engaging. 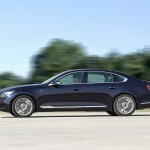 I kept the new K900 in “normal” mode for the duration of the drive as the roads were not particularly conducive to “sport.” Other journalists who did venture into sport had mixed reviews–some felt minimal difference, others felt a lot. 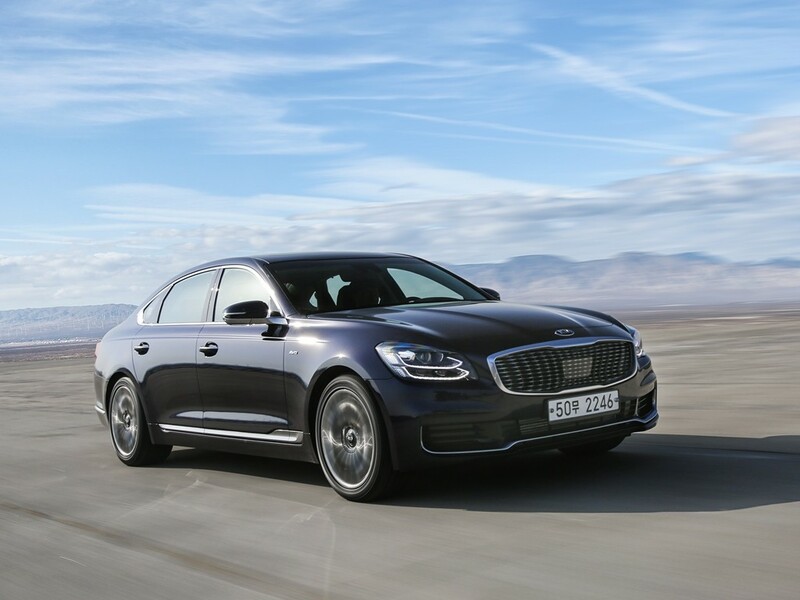 The vehicles we drove are Korean-spec, so there’s still time for some fine-tuning, like a tighter “normal” mode set up when the K900 debuts in the states later this year and a distinctive difference for “Sport” similar to that found in vehicles such the BMW 5-Series. 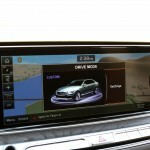 Overall, the new Kia K900 is a fine representation of Korean luxury. 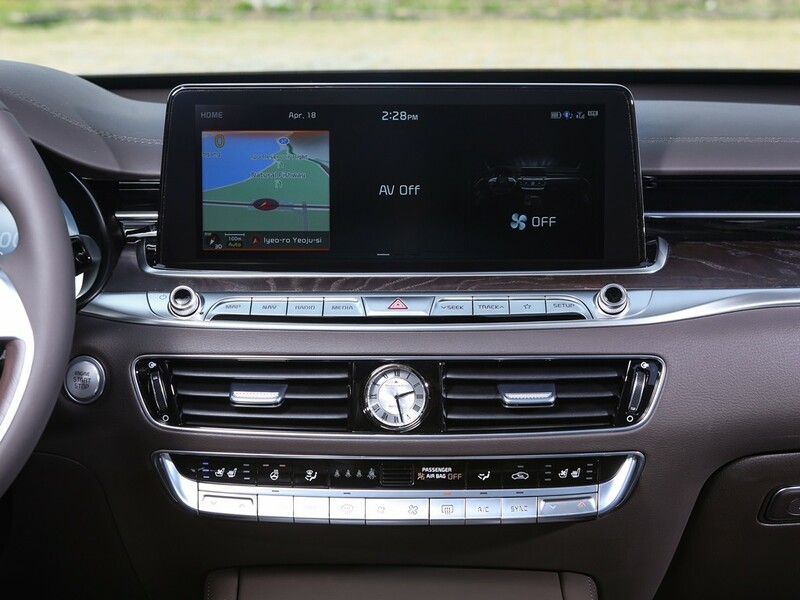 There are plenty of emotional solutions the well-equipped car provides, from the elegant interior to the spacious cabin and the standard AWD. 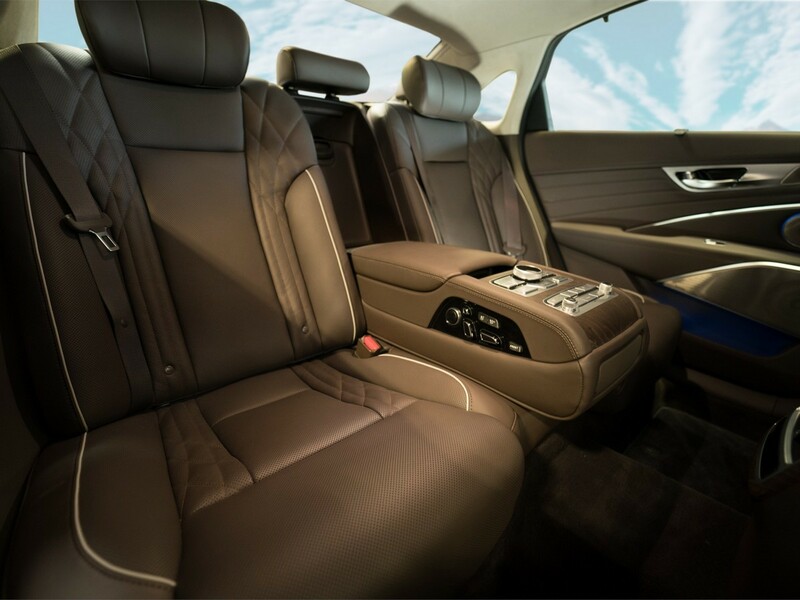 It’s a fine selection for someone considering a luxury sedan or even a crossover. 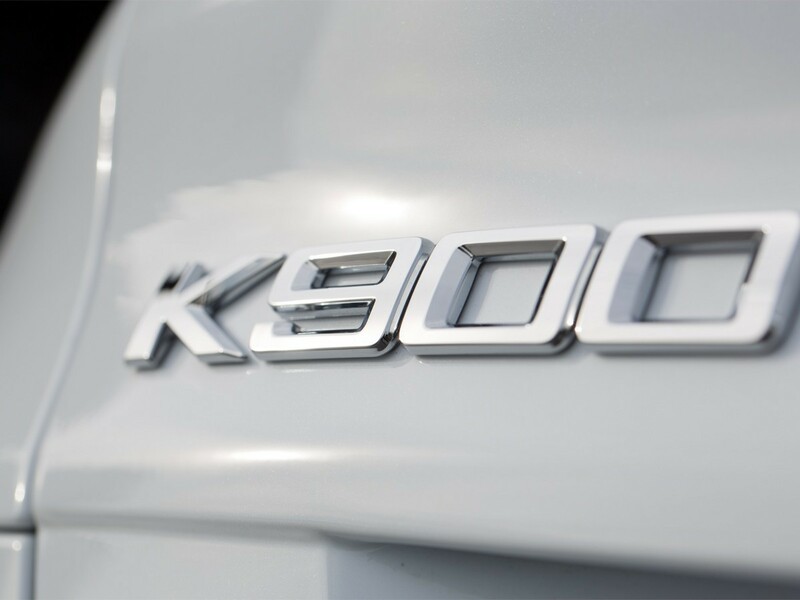 The all-wheel drive of the K900 provides reassurance while the plentiful list of standard equipment speaks to Kia’s history of providing excellent value for the money. 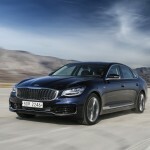 Some key competitors for the K900 include the all-wheel drive versions of the BMW 5-Series, the Audi A6, and the Cadillac CT6. 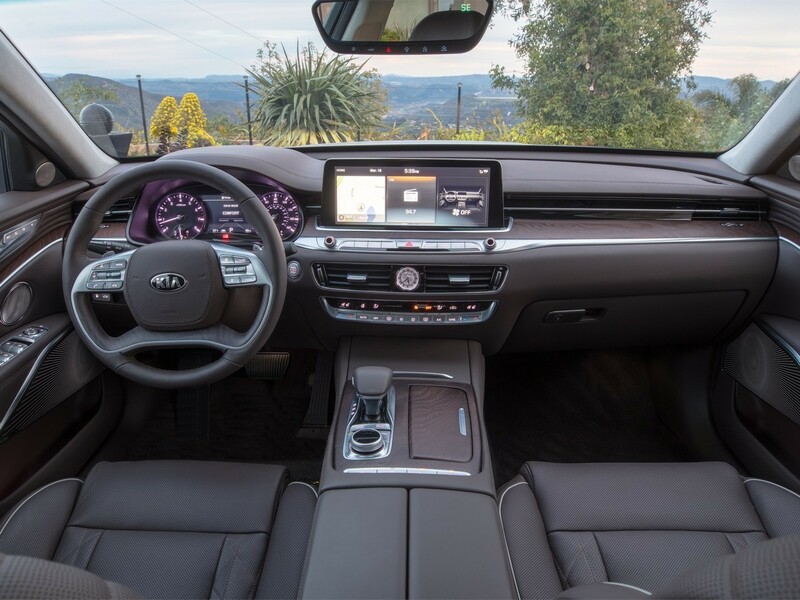 While the Kia brand may not immediately elicit oohs and aahs from the country club set, the appealing looks, lovely, relaxing interior, and driving performance certainly will. 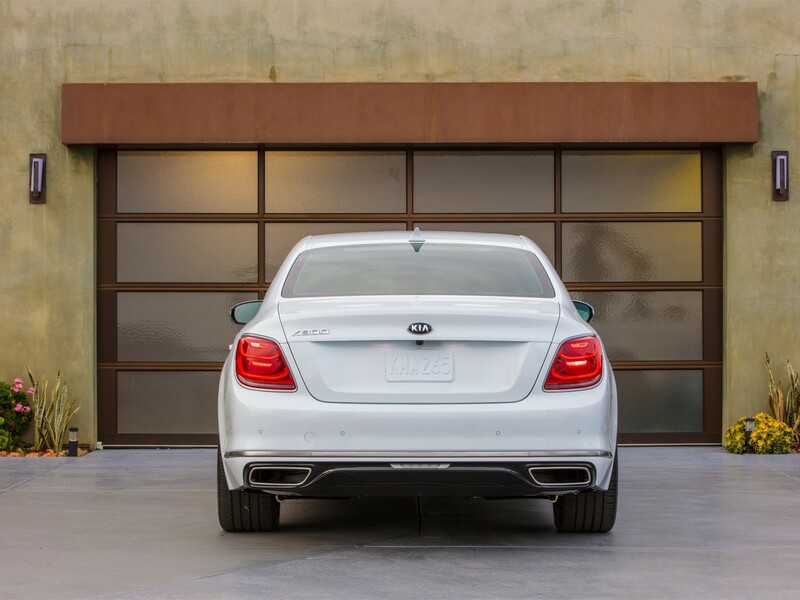 The 10-year, 100,000-mile powertrain warranty–significantly higher than key competitors–provides further assurance over the long haul. 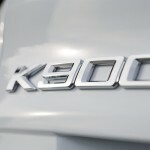 Kia hasn’t announced pricing, but the current K900 goes for about $55,000 so you can expect the same for the all-new K900 when it goes on sale later this year. 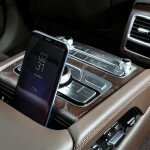 This entry was posted in K900 Articles on May 25, 2018 by Administrator.